IHRC is happy to inform you that the Decolonising Education pack is now back in stock. The pack is being sold at a 20% discount than if the items were bought individually. We will ship worldwide, and you can pay by credit or debit card or PAYPAL. 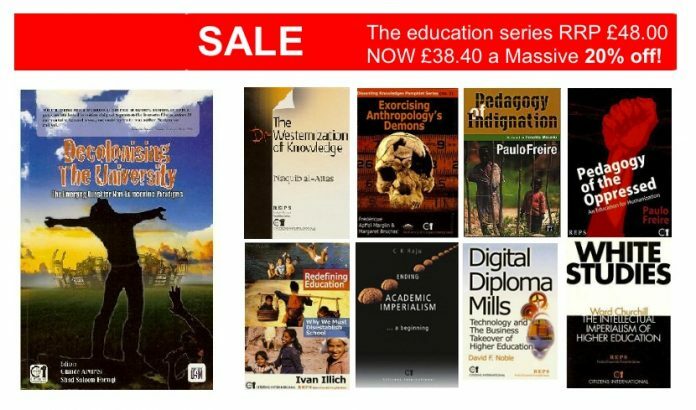 The Decolonising Education pack contains seven Citizens International Pamphlets and two books: Pedagogy of Indignation and Decolonising the University. It is a must buy for students, parents and teachers interested in deconstructing modern schooling and educational institutions and reconstructing ways of learning and education that are dedicated to liberation both socially and politically. The cost of the pack without shipping is £38.40 reduced from £48. If there happens to be a shortage on certain items in this pack due to a rush in sales, they will be replaced with a similar title. Customers will be asked before a replacement is made.